*You will need your car registration information to order your permit. The following regulations shall govern the operation and parking of motor vehicles on the campus of Indiana State University at all times of the year unless specifically noted. Parking regulations are subject to enforcement 24 hours a day, 365 days a year. Students and staff who bring vehicles to campus will be held responsible for the registration and proper operation of the vehicles. It is the responsibility of each member of the University community to read, understand, and abide by the regulations. Ignorance of the regulations is not an acceptable reason for appeal of a violation. The Cherry Street Multimodal Transportation Facility is a 24-hour parking garage and bus station located at 750 Cherry Street. Members of the ISU community may purchase monthly parking permits from ISU Parking Services. Parking permits will be required on all self-propelled vehicles that call for a state license or any other vehicle capable of being operated under its own power. The enforcement boundaries are identified as Third Street (west), the Seaboard Railroad (east), the Conrail Railroad (north), and Cherry Street (south). Enforcement also includes the University Apartments area; Remote Lot N (11th and Chestnut Streets); and Bob Warn Field parking (1st and Locust Streets) and remote lots west of Third Street. *Permits purchased in the office are subject to a $15 surcharge. Faculty, staff, and students are required to obtain a parking permit at the Parking Office within 72 hours (excluding weekends) after arriving on campus or beginning employment. One parking permit may be purchased per student or employee. The exception being, students and employees who operate a motorcycle/moped and a motor vehicle on University property must purchase a motorcycle permit in addition to a regular permit. Parking Services maintains sole authority to sell parking permits and to register drivers. Resale of a parking permit or purchase or a parking permit from anyone other than Parking Services is a violation and is subject to a $300 fine and vehicle towing/booting at the owner's expense. Do not share, sell, or give your permit to others. all fines received on the permit will be charged to the original purchaser. Garage Parking Permits—Garage/Surface Lot permits allow the user to park in the Cherry Street Parking Garage or any surface lot on the ISU campus (excluding metered, pay or specialty lots; i.e. Psychology Lot). 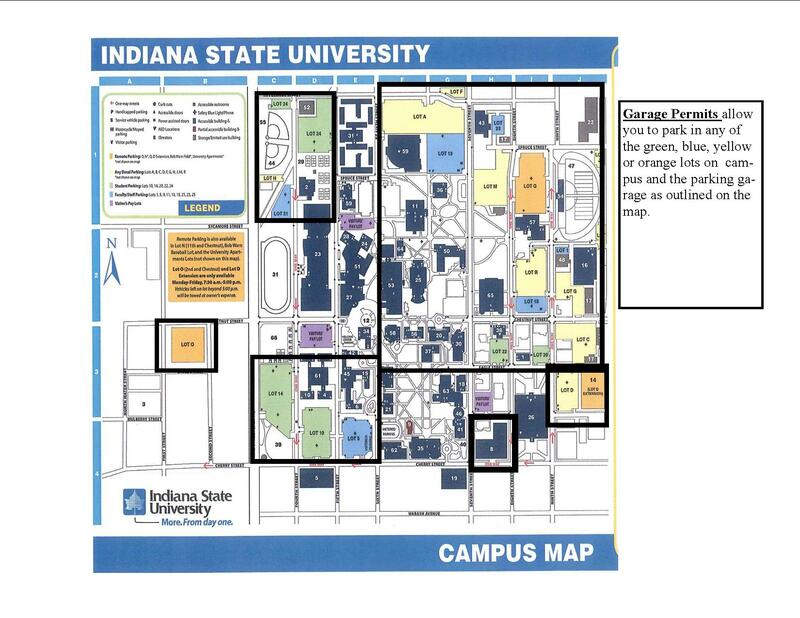 Sky Garden/Student permits allow the user to park in the Sky Garden Garage on Wabash Avenue or any student surface lot on Indiana State campus. Student Parking Permits—Allows the user to park in any student lot or staff/student lot on the ISU campus or any ISU remote lot (excluding metered, pay or specialty lots; i.e. Psychology Lot). Student Parking permits are not allowed in lots designated as "Resident Parking" after 9 p.m. Sunday-Thursday (Lots 10 and 14). Graduate students, undergraduates, graduate assistants, graduate fellows, and all others enrolled shall be defined as student for purposes of vehicle registration. 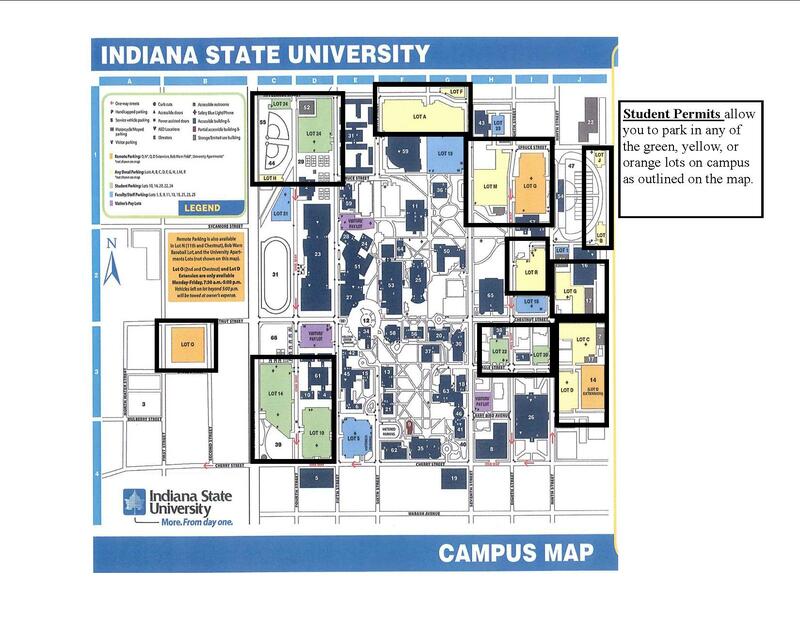 Resident Student Parking Permits - Allows the user to park in any student lot (including “resident parking”) or staff/student lot on the Indiana State campus or any Indiana State remote lot (excluding metered, pay or specialty lots; i.e. Psychology Lot). Graduate students, undergraduates, graduate assistants, graduate fellows and all others enrolled shall be defined as student for purposes of vehicle registration. Resident Student permits are only available to students living in ISU residential facilities. Remote Parking Permits—Remote parking permits are available for faculty, staff, and students. Remote parking permits allow the user to only park in the ISU Remote Lots. Remote lots include the Lot D Extension** (9th and Eagle Streets, behind Lot D), Lot N (11th and Chestnut Streets), Baseball Lot (1st and Locust), Lot Q (9th and Spruce Streets) and the ISU University Apartments (1st and Farrington and 1st and Crawford Streets). All remote lots will be open to any Faculty, Staff or Student. **Only available Monday-Friday, 7:30 a.m.-5:00 p.m. Vehicles left on the lot beyond 5:00 p.m. are subject to tow at the owner’s expense. Motorcycle/Moped Permits—Allows the user to park in any surface lot or motorcycle space. The operation and/or parking of all motorized vehicles on the sidewalks, pedestrian paths, bicycle racks, or lawns of property owned, leased, or used by Indiana State University is expressly prohibited. Moped and motorcycles shall affix the parking permit to the left front fork of the vehicle. Per Indiana BMV, all mopeds/scooters driven on public streets will be required to have valid license plates. Guest Permits—are available for individuals visiting campus for $3.00/day. A Guest Daily Permit will enable the individual to park in any surface lot (excluding metered, pay or specialty lots; i.e. Psychology Lot) for the day. Guests may also utilize the Parking Garage (750 Cherry Street) or the West Pay Lot (5th and Chestnut) for $1.00/hour or $6.00/12 hour period. Short term parking is also available in the North Pay Station lot (North entrance of HMSU) and the Pavilion Lot (7th and Larry Bird). Students, faculty, and staff are not considered visitors and may not display a guest permit at any time. Temporary parking permits are available for short-term parking needs. All parking permits are available at Parking Services. Staff, student, handicap and remote parking permits are issued for the school year and expire midnight August 16. The parking permit may be transferred to other motor vehicles driven by the permit owner to campus. Enforcement of the traffic and parking regulations is in effect everyday throughout the calendar year. Display parking permits from the rear-view mirror. The exception being motorcycles and vehicles with convertible tops. Vehicles which are unable to be locked, are issued an adhesive decal in lieu of the original hangtag. Scooters and motorcycles shall affix the parking permit to the left front fork of the vehicle. All vehicles parked on campus must properly display a valid parking permit. A vehicle not displaying a parking permit is recognized as an unregistered vehicle. If a parking permit becomes lost or stolen, it is the registrant’s responsibility to report and replace it immediately. Replacement permits are obtained from Parking Services at a cost of $55 ($130 Garage) or the current purchase price (whichever is the lesser amount). The operation and/or parking of all motorized vehicles, including motorcycles, mopeds, golf carts and hoverboards (also known as self-balancing scooters, battery-operated scooters, or hands-free segways), on the sidewalks, pedestrian paths, or lawns of property owned, leased, or used by Indiana State University is expressly prohibited—the exception being identified University service related vehicles and emergency vehicles. Congestion requires that speed be limited to ten miles per hour on campus drives and parking lots. The driver of a motor vehicle must have control of that vehicle at all times and failure to do so constitutes reckless driving. All traffic control signs and devices must be observed as others are depending on the driver’s judgment and compliance with Indiana law. In areas where motor vehicle traffic and pedestrian traffic conflict, pedestrians have the right of way when no other traffic control is present. Parking on or adjacent to snow mounds is prohibited. All four tires must be on the flat parking surface and in a valid space. Drivers must comply with the State of Indiana Motor Vehicle Code and Terre Haute city ordinances at all times in addition to these regulations. All accidents involving a motor vehicle on property owned, leased, or used by Indiana State University or the streets adjacent thereto, must be reported to the Public Safety Department as soon as possible. Parking lots are surveyed and parking is arranged to accommodate as many cars as possible. It is necessary to follow the arrangements to allow other vehicles access to and from parking areas. Parking spaces on asphalt are identified by painted stalls and on gravel lots by concrete bumpers. Parking in any driveway, alley, lot entrance, or exit is prohibited. Do not park on unmarked open spaces. Private property owners may tow at operator's expense. ISU parking lots are available without a permit from the hours of 5:00 p.m. to 7:00 a.m. seven days a week to students, staff, faculty, and visitors. A permit is required from 7:00 a.m. to 5:00 p.m. Monday through Friday. In addition, University Apartments requires a permit 24-hours-a-day, seven-days-a-week. Lot O and the Lot D Ext is open 7:00 a.m.-5:00 p.m., Monday-Friday only. Lot O is not open during the summer months. Vehicles parked on University property must be properly licensed, display a current parking permit, and be in a state of good repair and operable. Vehicles that do not meet these requirements may be considered abandoned vehicles. Abandoned/immobile vehicles may be removed from campus at the owner's expense. 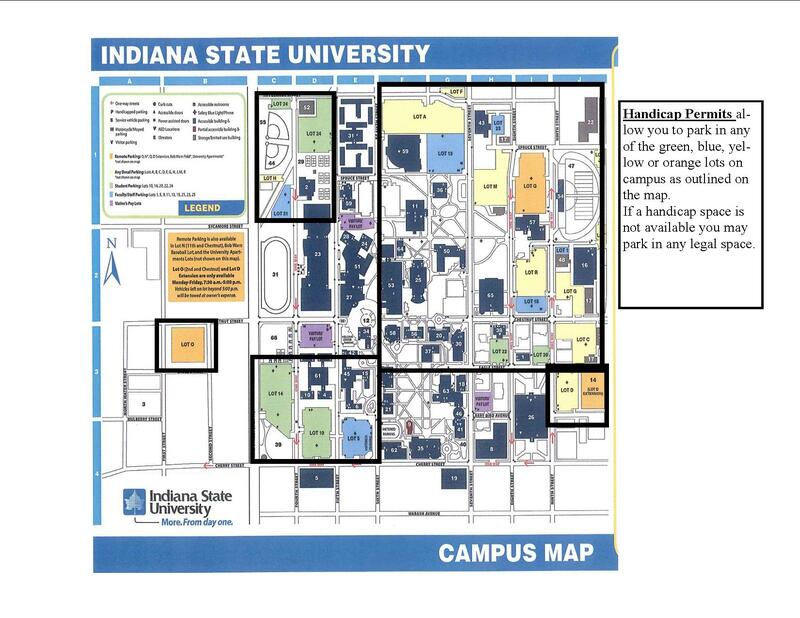 Handicap parking on Indiana State University property requires an ISU handicap permit. A state issued handicap plate or permit is acceptable if it is registered in the driver's name and displayed with a valid ISU staff or student permit. The ISU handicap permit can be requested by the disabled person with medical documentation. This documentation must include an expiration date so it is possible to determine the length of time the permit will be needed. Short-term handicap parking permits are also available with medical documentation. If you do not have current documentation on file, please contact the Parking Services office at 812-237-8888. Under Indiana Code 5-16-9-5(b), any person who knowingly parks in a parking space reserved for a person with a physical disability while displaying a placard to which neither the person nor the person's passenger is entitled commits a Class C infraction. Handicap spaces, fire and service vehicle zones, and unloading/loading zones (indicated by signs) will be strictly enforced at all times. Students with disabilities can learn about and arrange for auxiliary aids and services to meet their individual needs by contacting the Student Academic Services Center at 237-2300 in Gillum Hall. While ISU honors all valid handicap permits, staff and students are required to purchase a permit to park in the lots between 7:00 a.m.-5:00 p.m. The University Visitor's West Lot,, a large, 24 hour pay parking lot, is located west of the Hulman Memorial Student Union between 4th and 5th on Chestnut Street. Parking is available for $1.00/hour or $6.00/day unless the lot is reserved for a special event. For more information, contact Parking Services at 237-8888. Guest permits are available for individuals visiting campus for $3.00/day. A Guest Daily Permit will enable the individual to park in any surface lot (excluding metered, pay or specialty lots; i.e. Psychology Lot) for the day. Guests may also utilize the Parking Garage (750 Cherry Street) or the West Pay Lot (5th and Chestnut Street) for $1.00/hour or $6.00/12 hour period. Short term parking is also available in the North Pay Station lot (North entrance of Hulman Memorial Student Union) and the Pavilion Lot (7th and Larry Bird Streets). Students, faculty, and staff are not considered visitors and may not display a guest permit at any time. Students, faculty, and staff are responsible for their visitors. Enforcement of University traffic and parking regulations, which include state laws and city ordinances, is the responsibility of the Public Safety Department. ISU Police officers have the authority to halt vehicles, issue tickets for violations, remove vehicles improperly parked, enforce all regulations, and make arrests (Indiana Code 1971 20-12, ch. 3.5). A parking ticket issued by authorized Public Safety personnel for violations of these rules must be presented to the Parking Services office at the Public Safety Department within five working days (excluding weekends) of the date issued. After five working days, tickets are processed and billed to individual accounts through the Office of the Controller. Once a ticket has been billed, Parking Services cannot accept payment. 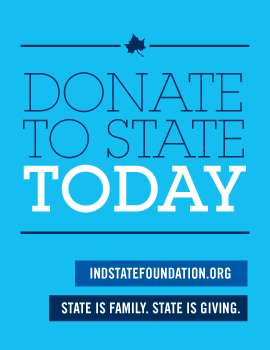 The person in whose name a parking permit is registered with Indiana State University is held responsible for any parking ticket involving the vehicle whether incurred by the registrant or the operator of the motor vehicle. Therefore, these regulations should be made known to any other person who may operate the vehicle with/without the permit displayed. The operator of a motor vehicle on campus shall observe these regulations and is held responsible for all moving violations committed, whether the vehicle is registered in the operator's name or not. Violators of state and city laws may, at the discretion of the Public Safety Department, be prosecuted in state or city courts. Motor vehicles operated by faculty, staff, and student that display a parking permit may park in areas designated as parking lots by signed posted for which they have the appropriate permit. A parked vehicle which interferes with normal vehicular or pedestrian traffic may be removed at the owner's expense. Any portion of a vehicle parked in a restricted area constitutes a violation, i.e., handicap, service vehicle, emergency, fire lane, yellow, and reserved parking. It is not necessary to receive a warning notice before a ticket is issued. Lack of a convenient space is not a valid excuse for parking in violation of the regulations. Parking is permitted only in authorized spaces marked by lines in the appropriate zone designations. Vehicles parked with tires touching or over the stall markers are subject to ticketing. Parking in a space identified for handicapped parking while not displaying a proper permit. Blocking a fire hydrant, walkway, handicap ramp, or roadway. Parking in an emergency lane. Five or more parking tickets (including warning tickets), paid or unpaid, from August 16, 2017 - August 16, 2018. Use of a lost, stolen, falsified, or fabricated permit. Falsely obtaining or using a parking permit that the user is not qualified to use (including possession or use of a lost, stolen, falsified, or fabricated permit) may lead to losing the privilege of having a motor vehicle on campus for the remainder of the current academic year. There is also a fine of $300.00 and vehicle impoundment at owner's expense. Violators of state and city laws may, at the discretion of the Public Safety Department, be prosecuted in state or city courts. Failure to obtain an ISU parking permit within 72 hours of bringing an unregistered vehicle on campus results in a fine of $25.00. Parking in an identified handicapped parking space without a handicap permit is a fine of $100.00. All other violations are a fine of $25.00. Violation assessments are made at Parking Services and are payable at the Office of the Controller after five working days of the date appearing on the ticket. Students who do not pay tickets or fines by the end of the semester in which they are incurred have their records encumbered and registration privileges revoked until the ticket or fine is paid. Faculty and staff who have outstanding, unpaid tickets may be denied a parking permit until the ticket or fine is paid. Payroll deduction for parking fines may be arranged through the Payroll Office. Vehicles may be immobilized if the vehicle violates University regulations, City of Terre Haute ordinances, and/or state laws pertaining to motor vehicles and has accumulated five or more parking tickets (including warning tickets) paid or unpaid, for the 12 month period beginning August 16 and ending on August 15 each year. Any attempt to move an immobilized vehicle or remove the wheel immobilizer (boot) may cause serious damage to the vehicle. Any damage caused by such an attempt is the sole responsibility of the driver. Unauthorized removal of a “boot” may lead to further disciplinary actions. In order to have the wheel immobilizer removed, the driver must pay a $50.00 removal fee, as well as any and all outstanding tickets on file with Parking Services. Tickets that have already been billed to the Office of the Controller are not included in this figure. This amount must be paid in with Visa/MasterCard or cash. Students who are booted more than two times may be subject to further disciplinary action for failure to abide by the Motor Vehicle Rules and Regulations. A ticket may be appealed in writing via application forms provided by Parking Services, if requested and returned within five working days (excluding weekends) of the date appearing on the ticket. Tickets not appealed in a timely manner become the responsibility of the driver. If a faculty, staff, or student vehicle becomes disabled on University property, the owner must contact the Public Safety Department at 237-5555. Place a sign stating, “Disabled List, call Public Safety 237-5555,” on the front window. The vehicle must be moved off Indiana State University property within 48 hours of the call. Web permits purchased beginning Monday August 12th will be held for pick-up in the office. Bring ID card with you to pick-up in Parking Services. I agree to follow the rules and regulations as outlined in the Parking Regulations Brochure.